A still-frame from a movie taken by NASA's Cassini spacecraft of Saturn's newly discovered moon (in red square). 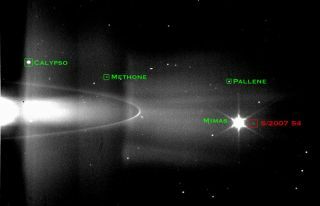 Initial measurements suggest the new moon, which is still unnamed, is about 1.2 miles (2 kilometers) wide, and lies between the orbits of Mehone and Pallene, two Saturnian moons discovered by NASA’s Cassini spacecraft in 2004. The newfound moon is about 1.09 million miles (1.76 million kilometers) from Saturn and could be part of a larger group of still undiscovered moons around the ringed planet. The moon was observed by Cassini on May 30, 2007. Saturn has the second largest tally of moons in the solar system next to Jupiter, which has 63. However, like the definition of “planet,” there is an ongoing debate about what size a satellite must be and how it must behave to qualify as a moon. If very small and as-yet unfound objects are ultimately included, the moon tallies could soar into the hundreds or even thousands.